Each year, during my visits to Greece, I spend some of my time in a monastery. At the end of this holiday, I spent this morning [11 July 2017] in the Monastery of Arkadi, which stands on a fertile plateau in the foothills of Psilorítis, 23 km south-east of Rethymnon. It was a pleasant early morning journey from Platanes up through the bright and welcoming mountain villages of Adele, Pigi, Loutra, Pigi and Kirianna, taking about half an hour through olive groves and vineyards, and along the side of the Arkadi Gorge. The main church or katholikon dates back to the 16th century but shows Roman, Venetian, Renaissance and Baroque elements in its architecture. This church is unusual with its two aisles, and is dedicated to both the Transfiguration and to Saint Constantine and Saint Helen. Since the 16th century, the monastery has been a centre for the sciences, art and learning. The church was built in 1587, replacing a smaller church dating from the 13th century. The façade, which was designed in renaissance style, was influenced by the work of the architects Sebastiano Serlio and Andrea Palladio. The monastery has a special place in the heart of all Cretans because of its role in the Cretan resistance against Ottoman rule. During the Cretan revolt in 1866, 943 Greek people, mostly women and children, sought refuge in the besieged monastery. After a three-day battle, they blew up barrels of gunpowder, choosing to death rather than surrender. I have been in Arkadi many times before, and today there only three monks living in the monastery. But despite the constant arrival of tourists and visitors and the dwindling number of monks, this remains a working monastery. This morning I wanted to see the new museum, which opened in Arkadi last year. Although most of the visitors today wanted to see display items that tell the story of the horrific events over a century and a half ago, I was interested in the surviving books from the monastery library, the collection of icons, and the liturgical items, vestments, stoles, patens, chalices and crosses. Most of the items come from smaller monastic houses (metochia) and chapels that were once dependencies of Arkadi. They date from 1629 to the mid-19th century, and the earliest are fine examples of the Late Cretan School. Arkadi once had a rich monastic library, but only a fragment of this collection have survived. Some of the volumes on display have elaborate covers, and many were produced on printing presses in Venice, which shows how the connection between Crete and Venice continued long after the Ottoman Turks captured Crete in the 17th century. Embroidered inscriptions on the liturgical vestments include the names of abbots, priests and deacons. They show an interesting mixture of western and eastern traditions: the monks used purple silk textiles as the background for Byzantine-style flat embroidery and western-style relief embroidery created with gold and silver wire and thread and gold or silver-wrapped cord. The iconography followed the Byzantine tradition, while the decorative motifs and details were inspired by western art. The new museum is housed on the ground floor of the south-west wing of the monastery. This is one of the oldest parts of the monastery buildings, and was originally used for storing wine and olive oil. Arkadi once featured on the Greek 100 Drachmai banknote, and the monastery’s image has been restored to popular currency with the issue of 750,000 new €2 coins in Greece last November to commemorate the 150th anniversary of the destruction of Arkadi in November 1866. One side of the new coin shows the monastery with inscriptions bearing its name and the name of Greece in Greek, along with the monogram of the artist George Stamatopoulos. Previous Greek commemorative €2 coins celebrated the marathon winner Spyros Louis, Greece’s 150th anniversary of the Union of the Ionian Islands and the 400th anniversary of the death of El Greco. We came down from Arkadi this afternoon through the villages of Roupes and Nea Magnisia, which takes its name from the classical Greek city near Ephesus in western Anatolia. The village was founded by Greek-speaking refugees, expelled from present-day Manisa, about 65 km north-east of Smyrna in Turkey in the 1920s – a reminder that the conflicts that almost destroyed Arkadia in 1866 continued for decades after. We were soon at Stavromenos, and travelled west along the old coast road back to Platanes. The story is told of a tourist who asked whether there is a Greek word that translates mañana. I have managed to spend time at the beach in Platanes most days during these past two weeks in Rethymnon, or go for a swim in the pool. There have been days in the mountains, visits to churches, monasteries, lakes, museums, galleries and exhibitions. There have been evening strolls to view sunsets. And there have been long meetings, meals and lengthy conversations with old friends. But sometimes – just sometimes – as I laze on the beach, reading books and newspapers, enjoying the sunshine and swimming in the Mediterranean, I feel I might be among the lotus eaters. In Greek mythology, the lotus-eaters (λωτοφάγοι, lōtophagoi) were a people living on an island over-run by lotus plants. The lotus fruits and flowers were the primary food on the island and were a narcotic, causing the inhabitants to sleep in peaceful apathy. In the Odyssey, Homer tells how adverse north winds blew Odysseus and his crew off course as they were rounding Cape Malea, the southern-most tip of the Peloponnese, as they headed west towards Ithaca. The crew are entertained by the islanders to a lotus meal, and soon stop caring about the return journey home. Against their wishes, Odysseus forces them back to the ships and to work on the oars. Scholars differ about the location of the island of the lotus eaters. In the fifth century BC, the historian Herodotus located the Lotus-Eaters on the Libyan coast of north Africa. But others say that if it is an island then Crete was their home. I have another day or two to go before this holiday ends, but you may have to wean me off my Greek diet before I agree to catch my plane back to Dublin. But first I am planning to head up into the mountains again early this morning to visit Arkadi monastery, and hope to spend another afternoon on the beach. This episode in the Odyssey inspired an episode in Ulysses by James Joyce, and later inspired the BBC television drama series The Lotus Eaters (1972-1973). The series written by Michael J Bird tells the stories of some British expatriates living on Crete and their reasons for being here in the closing days of the colonels’ regime. The leading characters are Erik (Ian Hendry) and Ann Shepherd (Wanda Ventham), a couple who run a taverna called the Shepherd’s Bar. Ann is a sleeper agent for British Intelligence; Erik has been a broken-down drunk, and Ann has married him as part of her cover. The Lotus Eaters was filmed in Aghios Nikolaos and of course tells of people who have lost the desire to return home. 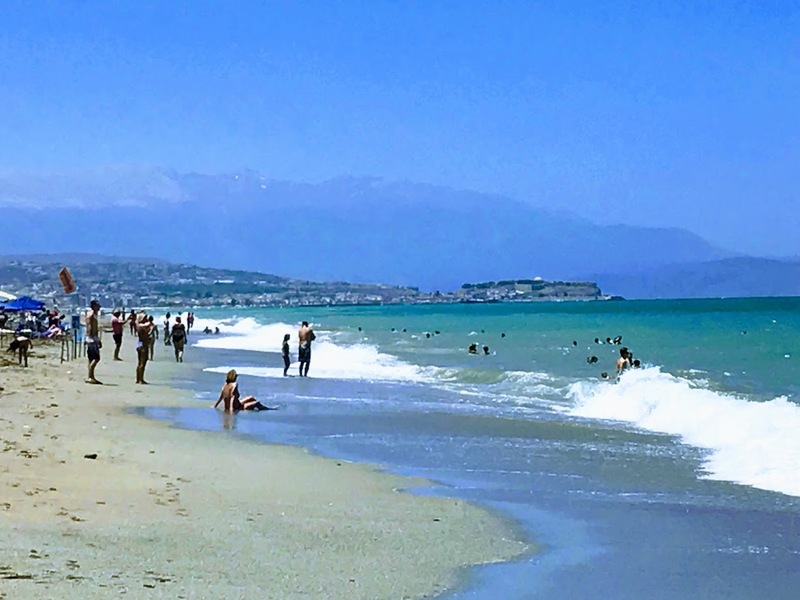 Eventually, however, as the series title has implied from the beginning, Erik and Ann have to leave Crete. As they leave on a plane from Iraklion, they have a partial reconciliation, for they are the only people each other can trust. The series was the first of a number of Mediterranean-based dramas written by Michael J Bird for the BBC. The others included Who Pays the Ferryman?, also set in Crete, The Aphrodite Inheritance, based in Cyprus, and The Dark Side of the Sun, located in Rhodes.